Standing majestically on a promontory on the east coast of Mull, Duart is probably one of Scotland’s most photographed castles, simply because the Isle of Mull ferry from Oban sails past every hour or so on its way in and out of Craignure. Built in the 13th century, Duart was a stronghold of Clan Maclean for over 400 years; the lands of the Macleans were spread across the west coast of Scotland and the islands of Mull, Jura, Coll and Tiree. The name comes from the Gaelic ‘Dubh Ard’ meaning ‘black keep’. Duart is first mentioned in 1367, in a papal dispensation which granted permission for the clan chief, Lachlan Lubanach Maclean, to marry Mary Macdonald, daughter of the Lord of the Isles. 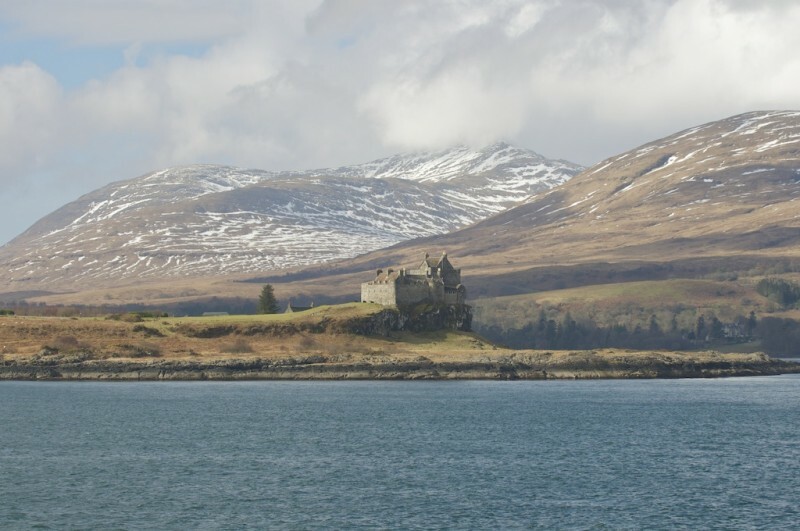 Mary was given Duart Castle as her dowry, and the Macleans therefore came to own much of Mull. The first buildings at Duart probably comprised a curtain wall around the rocky outcrop; Lachlan Maclean is credited with adding to the castle’s structure, building the great keep at the north-east end. Further improvements were made in the 16th and 17th centuries, strengthening the castle’s natural defences with ranges of buildings, a gatehouse, and thick walls in the form of a square. Another Lachlan Maclean, the 10th Chief, perished on Flodden Field in 1513; the battle was a disaster for Scotland, with King James IV and many Scottish noblemen slaughtered by a much smaller English army commanded by the Earl of Surrey. The 11th Chief, Lachlan ‘Cattanach’ Maclean, is remembered as being a scoundrel. He is best known for stranding his second wife, Katherine, on Lady’s Rock in the Sound of Mull, in the hope that the incoming tide would drown her. By the next morning she was no longer there, and he reported her death to her brother, the Earl of Argyll. However, some time later, Lachlan must have been surprised to find his wife sitting at her brother’s side at a banquet in Inveraray: she had been rescued from the rock by a passing fisherman. Unsurprisingly for those violent times, Lachlan was later found murdered in Edinburgh. In 1631, Lachlan, the 16th Chief, was made a baronet by Charles I; however, he was unable to hold Duart Castle against Covenanter forces under General Leslie in 1647. After the restoration of Charles II to the throne of England, Duart passed briefly back into the hands of the Macleans, but they lost it again in 1674 to the Duke of Argyll, to whom they owed considerable debts. Having served as a garrison for the Campbells, Duart was abandoned in 1751 and fell into disrepair. In 1911, it was owned by the Laird of Torosay, who was persuaded to sell the castle and part of the peninsula to Sir Fitzroy Maclean, and the buildings were restored at considerable expense. The scheme saw a ‘modern’ Edwardian house constructed within the walls of the castle. Duart is now the home of the 28th Chief of Clan Maclean, and is the oldest inhabited castle on Mull. Repairs were carried out in the 1990s, and in 1999 the castle was chosen as a setting for the film ‘Entrapment’, starring Sean Connery and Catherine Zeta Jones. 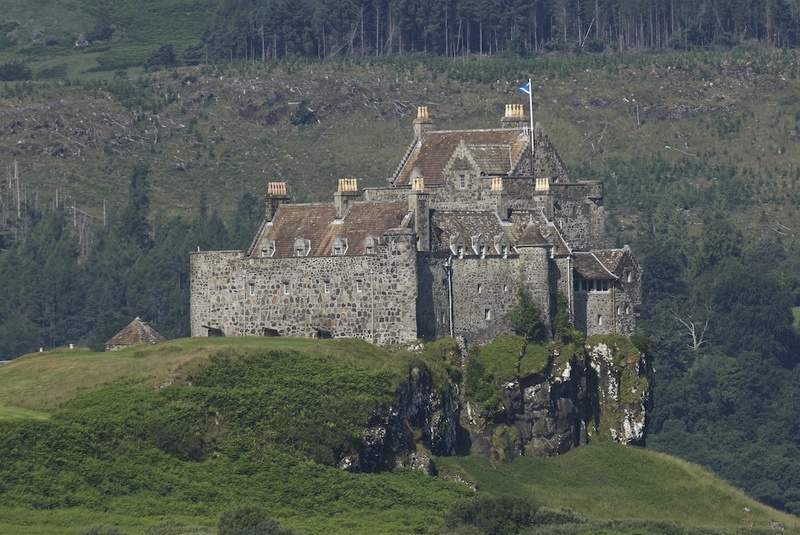 A Maclean Clan gathering takes place at Duart Castle every five years. What a wonderful historical site. From the perspective of the USA, it must be quite thrilling for the history buff to have such locations scattered across the landscape! Yes, we’re very lucky in that respect. It’s almost too easy to take them for granted, but once you stop and investigate you really get drawn in.